If there is Yes vote on 31 May. CABINET MINISTER RUAIRI Quinn said earlier this morning that the government will consider holding off on formally ratifying the Fiscal Compact even if the electorate vote Yes on 31 May. The Referendum Commission has confirmed that the Stability Treaty Referendum cannot be postponed. If the people of Ireland pass the referendum on May, it will be implemented by the government without delay. Speaking on Newstalk Breakfast this morning, Quinn was answering calls from trade union leader David Begg to delay the ratification of the treaty – not the referendum – while Europe was in flux over the debt crisis. 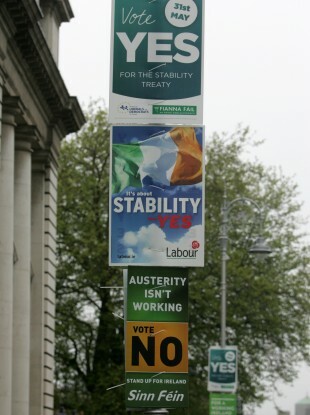 Quinn added that a Yes vote does not enshrine the treaty’s rules into the Irish constitution but gives the Dáil power to ratify it. The vote will definitely go ahead on 31 May but the formal ratification could be delayed, according to the comments this morning. This has since been denied. Asked to clarify the Government’s position on Begg’s proposal which was outlined in the Irish Times on Saturday, the Minister said that his colleagues Brendan Howlin and Michael Noonan had been in contact with the European Commission since the beginning of the year about a “parallel stimulus project”. He said that fiscal discipline and budget control is only part of the solution and the government would continue to look for parallel measures of stimulus and growth even after the vote on 31 May. Francois Hollande in France has said he will not ratify the treaty until a parallel growth package is secured. That is also the position of the Social Democratic Party of Germany, said Quinn. Also participating in this morning’s debate, Sinn Féin’s Pearse Doherty accused the government of signing up to something which didn’t have a mention of growth. He said as an Irish republican, he did not want Irish budgetary policy to be decided in Europe. Email “[Updated] Minister Quinn: Govt will implement treaty 'without delay'”. Feedback on “[Updated] Minister Quinn: Govt will implement treaty 'without delay'”.